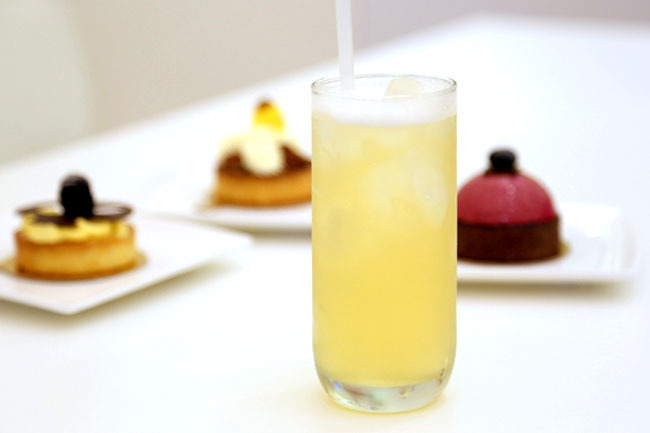 [Updated March 2015] Revisited Tart Blanc quite a few times. And my new found love, was the Peach & Salted Yolk Tart ($7.50) which contained slices of bruleed peaches sitting on top a sour cream coffee cake with a molten salted yolk filling. Reminded me of a very good Hong Kong egg tart. Divine. 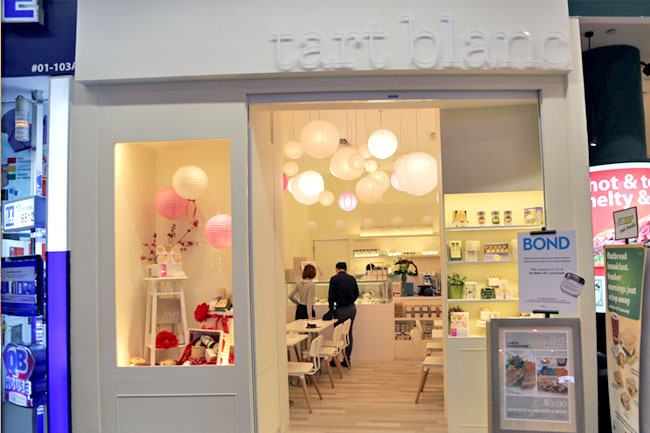 The visit to Tart Blanc reminded me of the first time I been to Kki. I wasn’t expecting much initially. 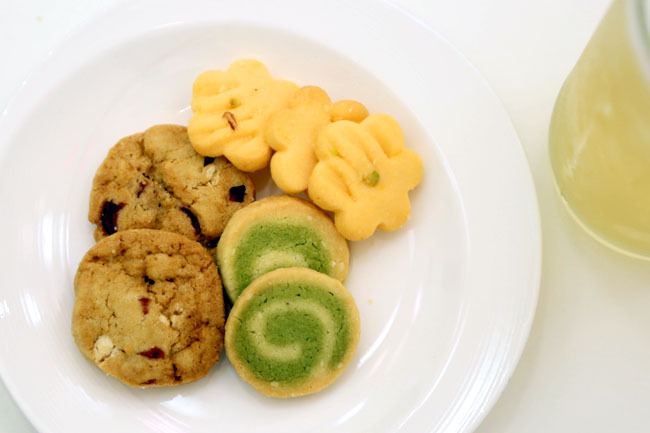 Both are small patisserie-cafes, two-person operation selling mainly sweet treats. But when you take your first bite of their product, you know they mean serious business. 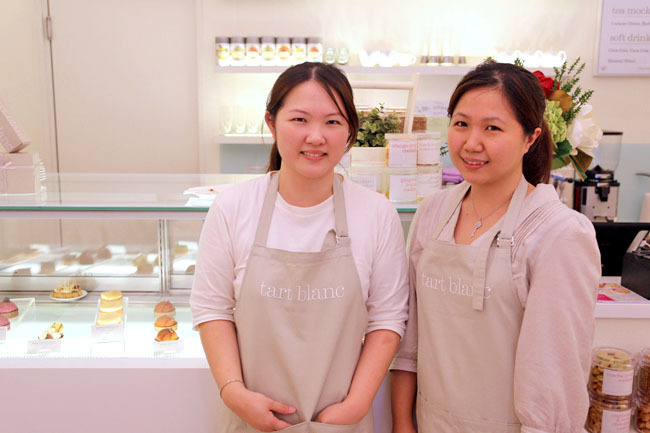 Tart Blanc at Millenia Walk has tarts as its focus, along with sandwiches, pitas, homemade cookies and flavoured teas. The clinical white washed interior, dainty and small cosy setting make the patisserie cafe a relaxing place to hang out for your afternoon teas. 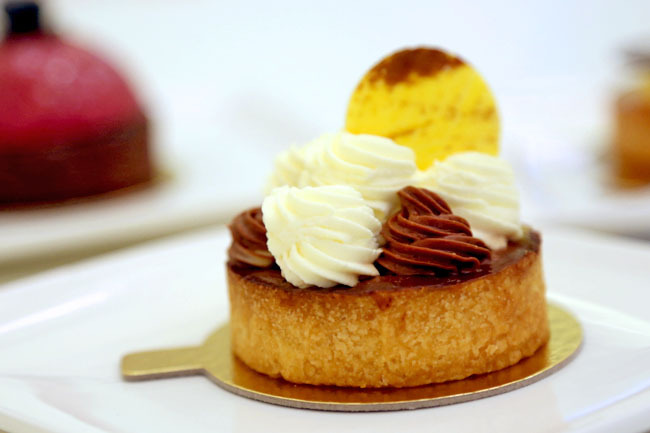 Like an excited child in a toyshop (and it was after a heavy lunch), I was busy scanning through all their gorgeous tarts, from Lemon Blackberry Tart ($7.50), Pistachio Chocolate Tart ($7.50), Saffron Poached Pear ($7.50) to Pumpkin Crack Tart ($7.50). I would highly recommend the Banana Chocolate Silk Tart ($7.50). Note: They have rotating offerings. 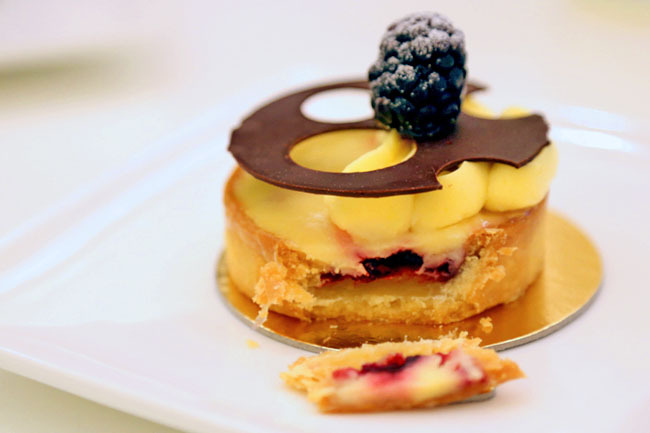 The tarts may look deceptively simple and just pretty at a glance, pricey for a small 7cm item, and oh, the base was somewhat tough to cut through. But every spoonful was a different relishing experience. It wasn’t an explosion of sorts, so just allow your taste buds to slowly slowly delight in the layered taste. 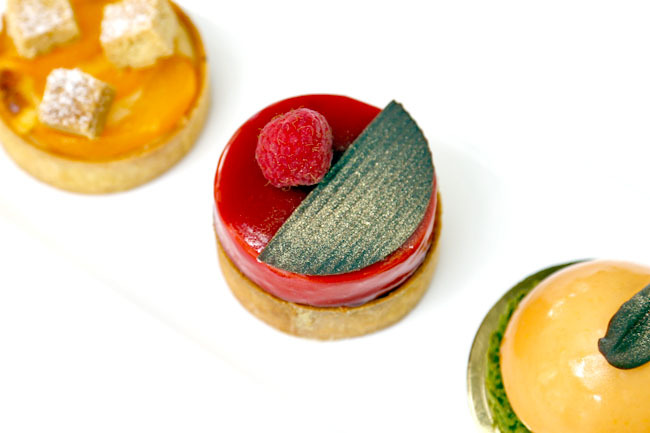 Each tart is made of 5 different layers. Take. your. time. to eat it. 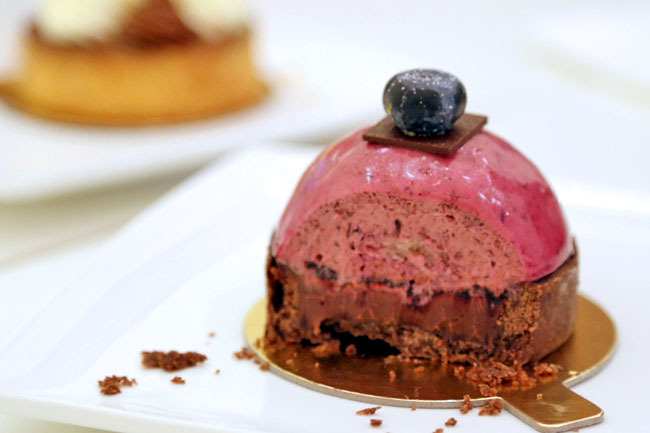 For example, the Blueberry Lavender Chocolate Tart is made with blueberry mousse and homemade blueberry jam, and towards the centre a lavender honey soaked joconde with lavender infused chocolate ganache where the lavender would kick it subtlety with become overpowering. I like to support the underdogs. 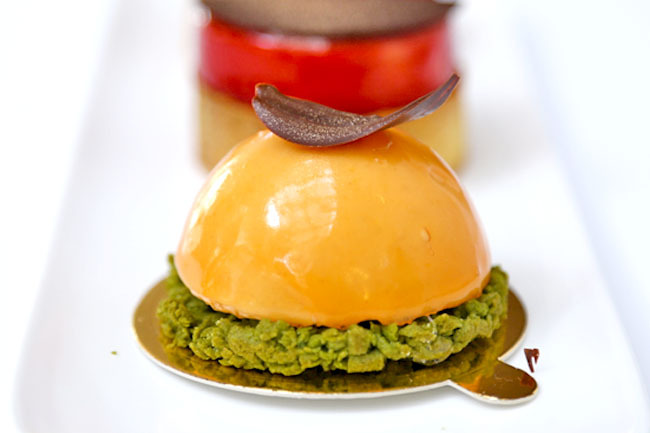 The owners are self-taught sisters (one been to a pastry school) who were inspired by their very own mother. Their love for pastries definitely surfaces through their tart, where you taste that every single one is made with passion and dedication. * This entry is brought to you by Millenia Walk. Though I have re-visited them and surprised that every time, there is always something new.